Randi Gullien (t.v. ), Eline Rostad og Anne Emilie Haakull var blant de norske radiografene som holdt innlegg på årets ECR-kongress. Her finner du abstractene. – Det er krevende, men svært givende å få lov til å presentere på ECR, synes fagradiograf Randi Gullien. Hun har deltatt på ECR en rekke ganger, både med egne innlegg, postere, og som medforfatter. I år holdt hun en presentasjon om en pilotstudie ved Ullevål, og var medforfatter på to andre innlegg. Temaet for Gulliens innlegg var evindensbasert praksis og kvalitet i mammografi. Radiografene Anne Emilie Haakull, Robin Lee Hammond, Jack Andersen og Eline Rostad var medforfattere. Gullien var i tillegg medforfatter på Per Skaanes foredrag om tomosyntesestudien ved Ullevål, og Bjørn Helge Østerås’ foredrag om doseratio ved tomosyntese vs FFDM mammogrammer. Abstractene finner du lenger ned. For å få delta med innlegg på ECR, må materialet være nytt og tidligere upublisert. – At vi får antatt innlegg på ECR viser at vi behersker forskningsnormene, og driver med prosjekter som er interessante for flere enn oss selv. Det er morsomt for en såpass liten avdeling som vår at vi klarer å få til noe internasjonalt. Det er en fjær i hatten, sier Gullien. Men det ligger mye arbeid bak en syv minutters presentasjon. – Man representerer på en måte både avdelingen, sykehuset – og Norge. Da må du være sikker på at du kan stå innen for alt. Til gjengjeld kan man få førstehånds kontakt med fagfolk fra hele Europa. – Jeg har kommet i kontakt med folk jeg sannsynligvis ikke ville møtt ellers. Vi diskuterer mulig samarbeid i fremtidige prosjekter. Det er noe av gevinsten. Når man har snakket sammen på en kongress, er det mye lettere å ta kontakt etterpå. 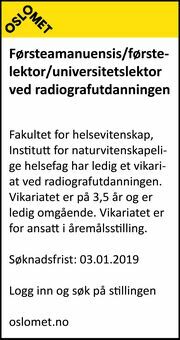 Purpose: To evaluate the inter-observer agreement between internal and external radiographers with and without experience in PGMI classification of mammograms using the classifications recommended in the quality assurance manual for the Norwegian Breast Cancer Screening Program (NBCSP). Methods and Materials: Three PGMI radiographers, A = internal experienced radiographer, B = external experienced radiographer, C = internal inexperienced radiographer, reviewed and classified 480 screening mammograms from 120 women. Using the PGMI classifications were P = perfect, G = good, M = moderate and I = inadequate mammograms, each radiographer classified the mammograms independently, by scoring them as: P = 1, G = 2, M = 3, and I = 4. Inter-observer agreement was assessed (Kappa analysis). Results: The agreement between the PGMI radiographers was: κ = 0.40, 0.40, and 0.44, respectively, for A + B, B + C, A + C. This level of agreement is classified as fair to moderate according to Kappa classification. The exact agreement between A + B, B + C, A + C was, respectively, 57 %, 56 % and 61 %. The best agreement appeared between the experienced and inexperienced internal radiographer (A + C), while there is less agreement between the two experienced (A + B). The lowest agreement was between the external experienced and the internal inexperienced radiographer (B + C). This indicate that there are a different competency levels between the three radiographers. Conclusion: Interobserver agreement with the PGMI quality classification in our pilot study was fair to moderate. This indicates that PGMI classification is a challenge in mammography screening, since there is room for individual assessments - despite guidelines. Purpose: Compare cancer conspicuity of digital mammography and tomosynthesis in a clinical setting. Methods and Materials: 129 women underwent mammography (2D) and digital breast tomosynthesis (DBT). Indication included lump in 30 (23%), abnormal mammographic findings 54 (42%), and surveillance 45 (35%) women. 20 (16%) had a benign biopsy, 25 (19%) a cancer, and 84 (65%) no biopsy. BI-RADS density was 1 in 10 (8%), 2 in 70 (54%), 3 in 43 (33%) and 4 in 6 (5%) women. 2D exams were interpreted on-site and DBT retrospectively after women left the department. Side-by-side feature analysis of cancer conspicuity was performed by 3 external breast radiologists trained with cases not included in the study. The readers interpreted bilateral 2D and DBT of 50 women without information about prior imaging, indication, pathology, or cancer mix in the test set. The test set included 23 cancers. Results: DBT resulted in 2 false positive recalls and 2 additional cancers. Feature analysis of cancer conspicuity for the 3 readers (2D higher, equal, and DBT higher score): Reader A 1,14,8; reader B 1,13, 9; reader C 3,5,15, respectively. Conspicuity was higher for 2D in 5, equal in 32 and higher for DBT in 32 interpretations. Scores for 14 cancers presented as spiculated mass or distortion:1,10 and 31 respectively. For 5 DCIS, scores were 3, 12 and 0, respectively. The mean cancer scores was 3.42 for 2D and 3.98 for DBT. Conclusion: Tomosynthesis shows higher conspicuity for malignancy than mammography, especially for spiculated masses and distortions. Purpose: Assess the glandular dose ratio and mean glandular dose for 3D vs. 2D screening mammograms using the European breast dosimetry protocol, for different BI-RADS density categorised breasts. Methods and Materials: 126 volunteers underwent 2D and 3D (combo) mammograms (468 combos in total), CC and MLO views. Protocol data were obtained from images. HVL and air KERMA was measured. Dose calculations were done using the European protocol including new proposed T-factors for tomosynthesis. Breast densities were categorised by an expert radiologist. 3D vs. 2D dose ratio was analysed separately for different BI-RADS categories. Results: BI-RADS 1 and 2 (N = 287 combo mammograms): Thickness: range 31 to 80 mm, average 58 mm, standard deviation 11,2 mm. Dose ratio: range 0,81 to 2,92, average 1,69 (average mean glandular dose values for 2D and 3D was 1,60 and 2,68 mGy), standard deviation 0,40. BI-RADS 3 and 4 (N = 181): thickness: range 17 to 79 mm, average 47 mm, standard deviation 13,4 mm. Dose ratio: 0,68 to 2,11, average 1,13 (average mean glandular dose values for 2D and 3D was 1,77 and 1,93 mGy), standard deviation 0,27. Conclusions: Extra dose of doing a 3D compared to a 2D mammogram on this system is lower for dense breasts (BI-RADS 3 and 4) than for less dense breasts (BI-RADS 1 and 2). This should be taken into account when assessing the potential gain of using tomosynthesis in a screening setting.